Whilst pursuing successful careers in the City our passion and love of good food was never far away. With many cookery classes in the evenings and at weekends behind us and an in depth knowledge of a variety of cookery styles and techniques, we embarked on our story. 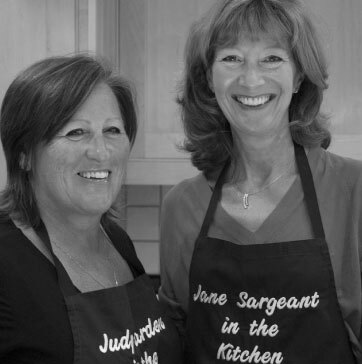 Both married with young families we started in a small way, catering and teaching friends to cook. Appearing on Channel 4 in the early 90’s and local radio also helped us on our way. Over the past 20 years our reputation for excellence and professionalism has been achieved solely by ‘word of mouth’ and our goal now is to bring our knowledge and experience to a wider audience. Our aim is to help everyone feel confident in the kitchen whilst learning techniques in a home environment. From sitting round the table with your family and loved ones to entertaining, good food is the one thing that brings us all together. We are passionate about what we do and hopefully that enthusiasm will ignite your interest and encourage you to widen your own knowledge in the kitchen. Our 2018 demonstration classes are now available!